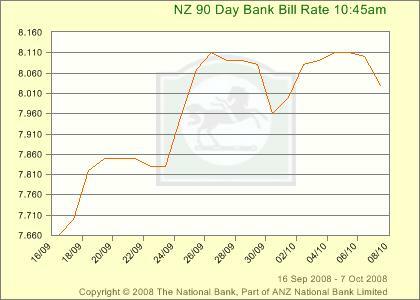 100 basis points slashed by the Reserve Bank of Australia. There cash rate is now 6%. A 50 basis point cut was expected, 75 seemed possible, 100 is epic. Does this indicate that the economic situation for Australiasia has deteriorated rapidly – yes and no. Governor Steven says in his statement that part of the reason for the cut in rates by the RBA is to counter the increase in bank funding costs stemming from the freezing of global credit markets. However, beyond that there is also some genuine easing – which aims to help buffer Australia from an anticipated decline in their terms of trade as growth through both the developed and developing world slows. Given this outlook, which is shared by the RBNZ, the question is – why doesn’t the RBNZ cut before the October 26 meeting to account for deteriorating credit conditions? Surely, a cut in the official cash rate to try and counter the recent lift in the 90 day bill rate (which has pretty much knocked out the 50 point cut in September) would fit into the Bank’s recent belief that they should react to rising financing costs.